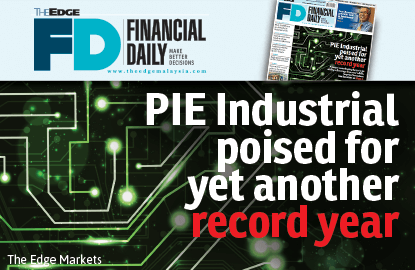 GEORGE TOWN: PIE Industrial Bhd, a Penang-based electronic manufacturing services (EMS) provider, is on course for a new growth record in its current financial year ending Dec 31, 2015 (FY15), buoyed by its vertically integrated business model. “We have strong in-house capabilities, from raw wire and cable manufacturing and wire harness to plastic moulding to surface-mount technology. We have successfully integrated our capabilities in order to make PIE a one-stop solutions provider in the EMS industry,” its managing director Alvin Mui Chung Meng told The Edge Financial Daily in an interview. The group posted record revenue of RM561.73 million in FY14, up 25% from RM449.04 million the previous year. However, net profit came in marginally higher at RM38.51 million in FY14 compared with RM38.03 million in FY13. For the first half ended June 30, 2015 (1HFY15), PIE Industrial’s net profit grew 16.3% to RM19.8 million from RM17.02 million in 1HFY14. Revenue, however, fell 9.2% to RM247.42 million in 1HFY15 from RM272.6 million in 1HFY14. “We intend to harvest the fruits of our vertical integration process [and] we believe it will be a record year in both net profit and revenue in FY15,” said Mui. “Having said that, for FY16 we are looking at more than 10% growth in both our top line and bottom line. It is part of key performance indicators for next year,” he added. Another major contributing factor to the group’s performance for FY15 is its ability to leverage the skills of Taiwan’s Hon Hai Precision Industry Co Ltd, trading as Foxconn Technology Group. Foxconn has a 30% stake in Taiwan-listed Pan-International Industrial Corp, which holds a 51.42% stake in PIE through Pan Global Holding Co Ltd.
“We have good technical support from Foxconn. For example, if there is an area where we have no expertise in, they will send a team over to assist us in all aspects such as layout and process flows and equipment fabrication. They also have a strong automation and robotics team, helping us with our automation processes,” said Mui. Another area in which the group benefits from its relation with Foxconn is the latter’s strong purchasing power. “Foxconn has been a [shareholder of our ultimate holding company] since 2000, but it was only five years ago that we realised that we could tap into their purchasing power in order for us to secure a more attractive price for our raw materials. This is vital to ensure that our pricing remains competitive in the EMS industry,” said Mui. In terms of geographical markets, PIE’s major markets are the United States, Europe and Japan. While PIE benefits from a stronger US dollar as its sales proceeds are mainly in the greenback, Mui said this is offset by its purchase of raw materials that are also traded in the US dollars. Mui also said PIE intends to continue to grow its strength as an EMS provider. At present, 80% of the group’s revenue is derived from EMS, while the remaining 20% is from its raw wire and cable manufacturing division. “We intend to grow our EMS business within the next two years, with our focus on the high-mix, low-volume products, good leverage from Foxconn and our in-house vertical integration and automation efforts”, said Mui. PIE (fundamental: 2.5; valuation: 1.6) shares closed down 0.13% to RM7.46 yesterday, with a market capitalisation of RM572.99 million. Year to date, its share price has appreciated by 29.41%.